This book is targeted to business, data, and analytics professionals who want to build rich interactive visualizations using Tableau. Familiarity with previous versions of Tableau would be helpful, but is not necessary. Tableau is a software tool that can speed up data analysis through its rich visualization capabilities, and help uncover insights for better and smarter decision making. This book is for the business, technology, data and analytics professionals who use and analyze data and data-driven approaches to support business operations and strategic initiatives in their organizations. This book provides easy-to-follow recipes to get the reader up and running with Tableau 10, and covers basic to advanced use cases and scenarios. The book starts with building basic charts in Tableau and moves on to building more complex charts by incorporating different Tableau features and interactivity components. There is an entire chapter dedicated to dashboard techniques and best practices. A number of recipes specifically for geospatial visualization, analytics, and data preparation are also covered. By the end of this book, you&apos;ll have gained confidence and competence to analyze and communicate data and insights more efficiently and effectively by creating compelling interactive charts, dashboards, and stories in Tableau. This book is a collection of independent recipes that cover a wide range of options for data visualization on offer with Tableau. 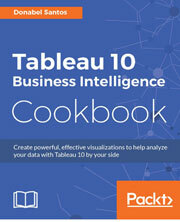 With the help of the recipes in this book, you can explore Tableau and pick the business intelligence solution that&apos;s best suited for your needs.